The GT Verb is a gateway to a new era for hard-tail riders. As the time goes by, the GT engineering and design lets us, hobby enthusiasts and everyday riders to come forward and meet at a more affordable level. 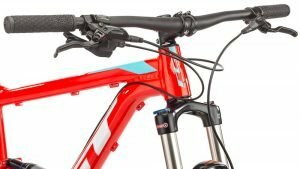 The Verb is a revolutionary bike in that matter where it sets the price and quality level over to the quality side, at an extremely reasonable price. This epic, extremely nice and agile looking bike has got everything to push you through the trails with ease. If you are coming from a hard-tail background, the GT verb will be your perfect host. It is also a reasonable everyday riding bike for people, who are looking for a comfortable, manually adjustable and durable trail-bike. The Verb is classified as a bike for mid-level riders, who take no exceptions in performance. It’s got the Independent Drivetrain, or as the GT calls the I-Drive system which is a state of the art technology borrowed from more top-of-the-range bikes. 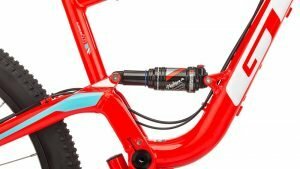 Simply put – the pedals, chain and the rear sprockets are running independently while the rear shock is not interrupting the game. That means there’s less drag, preserved momentum for smoother and faster ride. The only available color scheme is red, which might be a clever marketing trick, as the Red will be something to be noticed. Since it is marketed for hard-trail riders looking to up their game, you will be seeing lots of talented ex hard-trail riders riding past you with this beast. 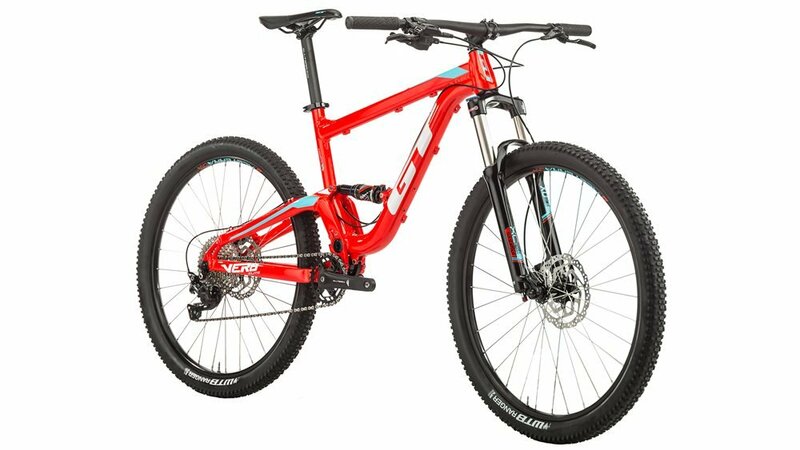 The GT has been in the competitive racing scene since 1972, and the Verb Elite gets you into the dual suspension game at hardtail prices. Grab a chance right here! On the bumpy side, you will be taken care by the All Terra A0-42 rebound adjustable Air Shock on the rear. The SR Suntour 120mm travel front fork is equipped with Lock-Out and adjustable Rebound. Brakes: Stopping power is provided by Shimano 180mm rotor hydraulic disc brake rotors. And the good news won’t stop right there. You will be seeing the All Terra Badge in the: Cockpit, Seat Post, Saddle, Seat Clamp, Stem and on the handlebar. Gears will be shifted by the Shimano Deore M6000 on your right side only. Conclusions: This bike has got everything to move from hardtail to a dual suspension game. Since it is quite adjustable according to the track and features pretty solid components, this is definitely worth its price. And it looks nicely agile as well, Designed for the mid-level user to ride on trails, I’m sure it does not leave anyone cold when taking it to nice and groovy trails. This bike looks nice, performs well and comes with a reasonable price tag. If you are planning to ride some extreme down-hill tracks with this bike – I would suggest you not to do so. Although the GT Verb Elite is a dual-suspension bicycle, it is still meant for trail riding. All the components perform well on the mid-level riding, but you should be thinking of upgrading when you are planning to take it on a hard spin every day. Other words, It is a perfect bike for someone who is coming from a hard-tail background and looking to give a go with a hard-tail. 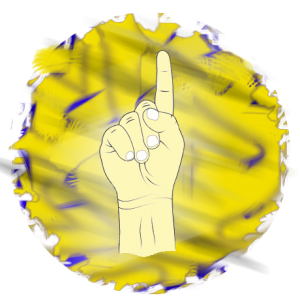 Grab a chance right here!